Leaders create visions of the future and motivate others to engage in that vision. 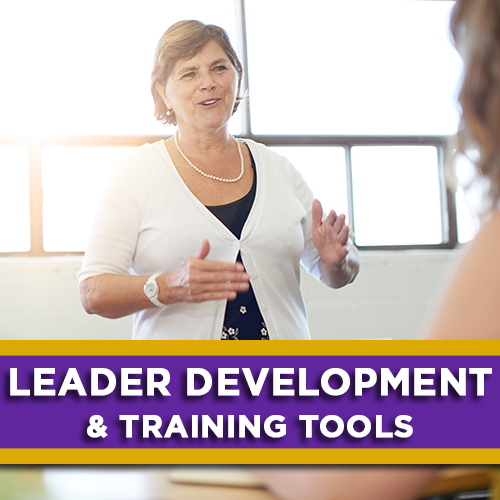 Leadership Development expands women’s capabilities to perform leadership roles within the LWML. Gaining, Training, Maintaining Women of the LWML — The mission statement of the Lutheran Women’s Missionary League does not address gaining, training, and maintaining participants in LWML. So how do they come about? Leadership 101 — What is leadership? How can you be an effective leader? Lucy Leader is In! — Have fun with this sketch promoting LWML Leadership Resources. Look of a Leader — The ABC’s of Leadership, Ten Commandments for Leaders, activity ideas, and more make this ideal for a leadership development workshop or individual reflection. Flowering LWML Leaders — God is the ultimate gardener and you are his special seed. Leadership in Pairs — LWML leaders have many partners. God, peers, mentors, predecessors, neighboring LWML groups and more are there to support you as a leader. Motivation is Contagious — An equipping resource on how to be a motivated leader. Stay Calm and Transition On — A two part resource to guide outgoing and incoming officers to complete an effective transition of office. LWML Handbook — The LWML Handbook contains everything to know about the organization; relationships of the local group and individual members to zone, district and national LWML, history, and meeting helps. LWML Leaders Manual — The LWML Leaders Manual details the responsibilities and duties of our LWML leadership, which is helpful for those who are elected or appointed to serve on the national level as officers or committee members, and may be referenced for district positions as well. Personal Development — Discover your spiritual gifts with this package that includes a Bible study, sketch, and discussion questions. Developing a Personal Mission Statement — This resource will equip and engage you to write your own personal mission statement and may be used as group event activity. Time Management — Helpful steps to manage yourself in a healthy, timely manner. This three-part Bible study and leader’s guide with insights into developing leadership attitudes and skills is ideal for a leadership workshop or Board of Directors’ study. This spiritual gifts Bible study, including links to online spiritual gifts inventories, works for any size group. Bible Studies on mentoring can be found in the Mentoring Resource Kit and in Woman to Woman Mentoring.